The aliens are on their way, but at least they told us when to expect them. Cybernate's co-op arcade platform shooter (with co-op!) Super Mutant Alien Assault will land on Xbox One, PlayStation 4, and PC on July 12. Bring a tinfoil hat. 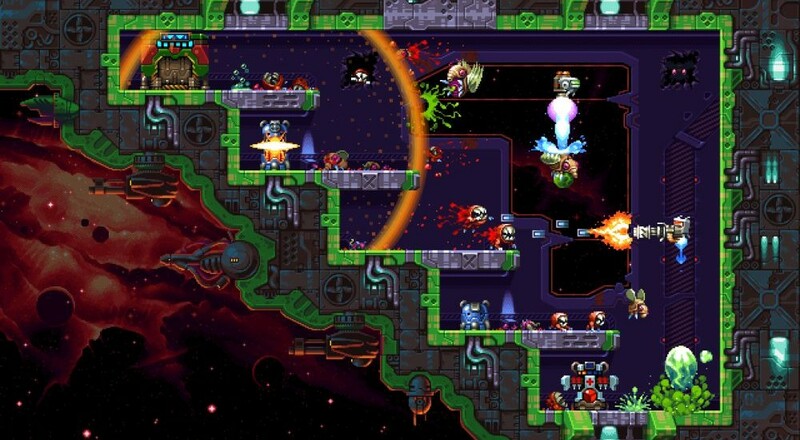 Super Mutant Alien Assault, which we refuse to abbreviate as SMAA because it looks ridiculous, takes inspiration from some of the most popular and challenging arcade games, such as Super Crate Box. It features randomized single screen levels and a painfully difficult mix of shooting and avoidance, forcing you to go on the defensive almost as often as you attack. It's hyper enough in solo mode, but when you add in two player local co-op, things get even better. Just watch out for friendly fire. Unlockable weapons, abilities and perks are Super Mutant Alien Assault's bread and butter. Because each level is randomized, you never know where vending machines will appear or what items they'll regurgitate. You can unlock additional spawnables the longer you play, meaning the more punishment you take the more you can dish out. Super Mutant Alien Assault has been on Steam's Early Access program for some months, but this summer marks its official release. Watch for it July 12 on PS4, Xbox One, and PC. Page created in 1.6631 seconds.